Whether you already own a kayak, or you’re thinking about buying one, you’ll need a way to navigate once you’re on the water. Recreational kayaking, adventure kayaking, and even kayak fishing all benefit from modern technology – the right kayak GPS unit can be more than just another gadget. It can save you time, hassle, and energy. It can also save your life. Of course, there are tons of GPS units on the market, all claiming to offer exactly the features and functions that you need. How do you tell them apart? We’ve scoured the offerings available and come up with what we believe to be the 10 best kayak GPS offerings for 2019. Whether you want to pair your GPS with a fish finder, need something that can pull double duty in other situations, or want a dedicated unit for your kayak, our list has something for you. We’ll start out with a list ranking our 10 favorite kayak GPS units, as well as how they stack up to one another in a head-to-head comparison. Then, we’ll move on to a detailed examination of what each GPS unit brings to the table. Finally, we’ll walk you through everything you need to consider when buying a kayak GPS unit in our buying guide. Ready to get started? Let’s jump right in with our comparison table. Garmin GPSMAP 64st Handheld 160 x 240 pixels 2 AA batteries, or rechargeable No No 2.6 inches 8 GB Check on Amazon! 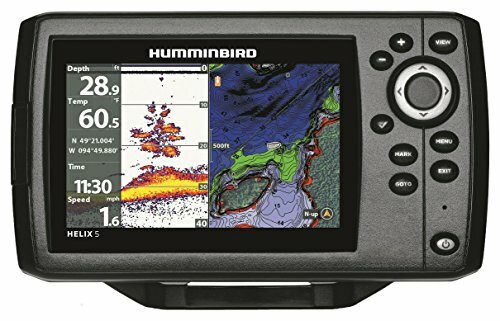 Humminbird 410210-1 Helix 5 Mounted 800 x 480 pixels External battery (615 mA) Yes No 5 inches Micro SD Card Check on Amazon! Garmin Striker 4 with Transducer Mounted 480 x 320 pixels External battery Yes No 3.5 inches Not listed Check on Amazon! 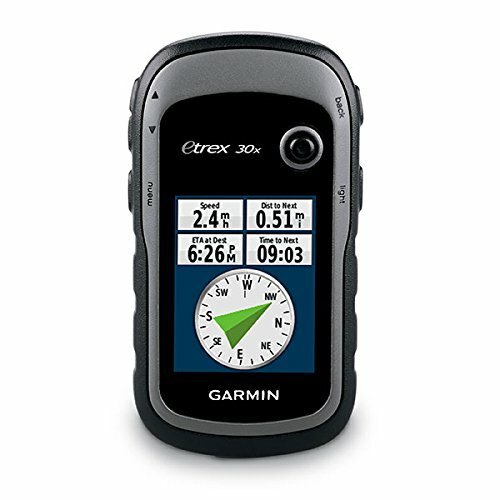 Garmin eTrex 30x Handheld 240 x 320 pixels 2 AA batteries No No 2.2 inches 17 GB plus Micro SD Card Check on Amazon! Garmin Oregon 650t Handheld Not listed 2 AA batteries or rechargeable No 8 MP 3 inches 4 GB Check on Amazon! Garmin Montana 680t Handheld Not listed 2 AA batteries or rechargeable No 8 MP 4 inches Not listed Check on Amazon! 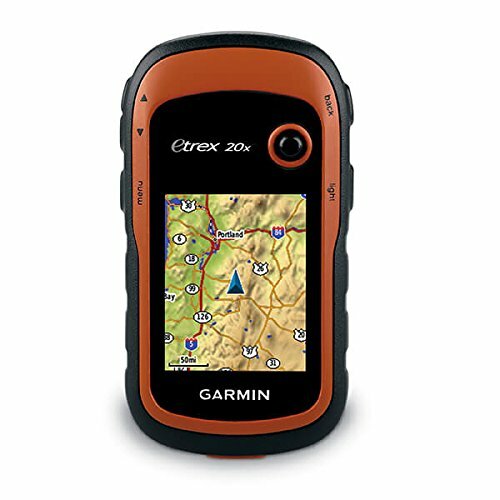 Garmin eTrex 20x Handheld 240 x 320 pixels 2 AA batteries or rechargeable No No 2.2 inches 3.7 GB plus Micro SD Card Check on Amazon! Garmin GPSMAP 78 Handheld 160 x 240 pixels 2 AA batteries No No 2.6 inches 1.7 GB plus Micro SD Card Check on Amazon! Garmin Oregon 700 Handheld Not listed 2 AA batteries or rechargeable No No 3 inches 1.7 GB plus Micro SD Card Check on Amazon! 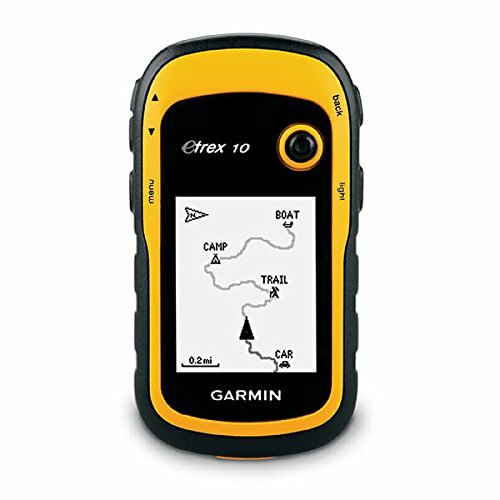 Garmin eTrex 10 Handheld 240 x 320 pixels 2 AA batteries No No 2.2 inches Not listed Check on Amazon! With our head-to-head comparison out of the way, it’s time to get into the details. What does each of the top 10 kayak GPS units bring to the table? Below, we’ll dig into each unit and highlight why it made our list. The top-rated kayak GPS on our list, the Garmin GPSMAP 64st is an excellent option for anyone who wants a highly-portable, compact GPS unit. While it does not offer fish finder capabilities like a couple of the units on our list do, it is well-suited for any kayaking expedition, whether you’re paddling through calm water, or heading offshore for some fishing enjoyment. The screen is a decent size, and it is designed to be highly readable in the sunlight. Battery life is also good, clocking in at 16 hours. Of course, the unit is also waterproof, and boasts an IPX7 rating. The unit comes with 100,000 topographical maps out of the box, plus one year of BirdsEye Satellite Imagery. This unit is also waterproof. One of the high points with this GPS unit is its significant onboard memory – you get up to 8 GB without having to use an expansion card. It also offers USB connectivity so you can connect it to your PC or laptop to update maps and firmware, and it is Bluetooth capable, too. This unit is also compatible with Garmin Connect and Live Track, which allow you to share information with smartphones, and pair the unit with additional accessories, such as heart rate monitors. The 3-axis compass offers at-a-glance directionality, and the barometric altimeter is also handy. The largest kayak GPS unit on our list, the Humminbird 410210-1 Helix 5 boasts a 5-inch, 256 color screen. The unit is not really all that portable, though. It’s designed to be mounted in your kayak. It also requires a 615 mA power supply. One of the most interesting aspects of this kayak GPS unit is that it offers both GPS functionality and also doubles as a fish finder. It features a maximum sonar depth of 1,500 feet, but the optional transducer (sold separately) can amplify that to 2,500 feet. It uses CHIRP DualBeam PLUS Digital Sonar with 4,000 watts PTP output power. Anglers are able to customize the way the sonar information is displayed by adding or removing details and choosing between two different display modes. In terms of GPS, you’ll find that this unit delivers precise satellite location information with chart plotting, as well as baked in UniMap cartography. The Micro SD card slot allows you to upload additional maps to the unit, as well. The Garmin Striker 4 offers a 3.5-inch screen, and a compact body that can be used as a handheld device. However, note that this kayak GPS unit is actually designed to be mounted (it comes with the mount, as well). Like the Humminbird model reviewed above, the Striker 4 offers both GPS and fish finder capabilities via CLEARVÜ Scanning Sonar. To make usage simpler, the Striker 4 does not have a touchscreen. Rather, it focuses on simple, intuitive button controls that ensure you can get the information you need even if your fingers are wet. The built-in CHIRP sonar system offers up to 1,600 feet of visibility in freshwater situations, or 750 feet in saltwater. The fish finder feature also offers a waypoint map that allows you to mark locations of your choosing, whether those are underwater features, or structures like docks or boat ramps. There is also an A-scope function, which allows you to view fish passing beneath your kayak in real time. Finally, the Striker 4 also offers a built-in flasher that lets you view your sonar data in classic format, which works well for vertical jigging, as well as for ice fishing. 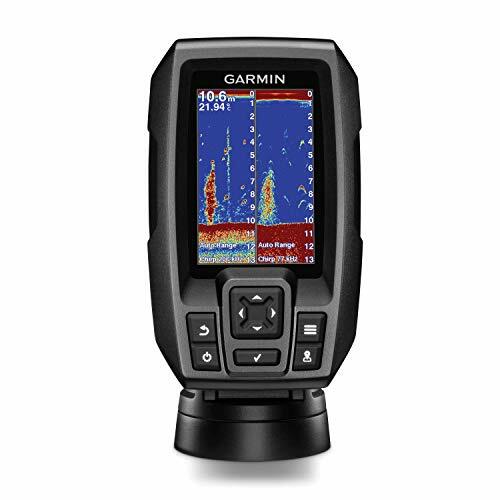 Unlike the previous two models, the Garmin eTrex 30x does not offer any sort of fish finder capabilities. However, that does not mean it’s not worth your time. It still ranks as one of the 10 best kayak GPS units on the market thanks to some of its industry-leading features. One of the most important features is the unit’s size and compact form factor. It can easily slip into your pocket, and it weighs very little. Despite that, it still offers a 2.2-inch, full color screen. This unit uses a WAAS-enabled GPS receiver, with HotFix and GLONASS support to help ensure fast pinpointing of your location. To improve the accuracy of your travel, the eTrax 30x comes with a 3-axis compass built in, as well as a barometric altimeter (not that you’ll need that on the water). It is completely waterproof (IPX7), and it comes with Wi-Fi connectivity and Bluetooth so you can share your map data with others. You can save up to 200 routes, along with the ability to track 10,000 points of interest or geocaches. Note that this unit does use a touchscreen; it offers 65,000 colors and is designed to be readable in the sunlight. Another compact handheld kayak GPS, the Garmin Oregon 650t offers a lot of features and functionality. Note that this does not offer fish finder capabilities, though. 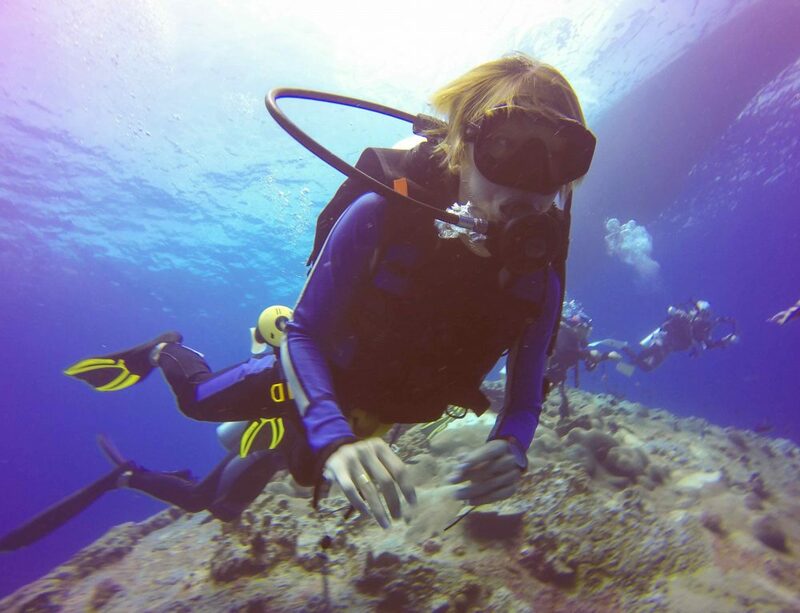 What will you find with the 650t? First, it offers a 3-inch touchscreen with full color display that is designed to be completely usable in direct sunlight. It also boasts 4 GB of built in memory, and the ability to expand that with an SD card, if you like. It runs on 2 AA batteries, or you can use a rechargeable battery pack, and it is also ANT and Bluetooth compatible. While this unit might not act as a fish finder, it does include an 8 MP digital camera. You can snap photos of your catch, or of the locations you visit in your kayak. You also get access to Garmin Adventures, where you can share those photos with other Garmin users. Of course, you can offload them to your smartphone or computer, too. In terms of maps, you’ll find that this unit offers topographic map data for the entire United States, including Alaska, Hawaii and Puerto Rico. There’s also a worldwide base map on offer. The built in GLONASS and HotFix technology ensure that you’re always connected to the satellite, as well, even in remote locations or heavy cover. The Garmin Montana 680t is an excellent choice for any kayaker, but is also a good option for geocaching, as it comes preloaded with 250,000 geocache locations around the world. The Montana 680t shares many of the features found with the Oregon 650t. The most significant differences are that the screen is 4 inches rather than 3 inches and that the touchscreen is designed to be glove friendly, so you can use it without having to take off your hand protection. The Montana 680t includes 100,000 topographical maps of the entire US, as well as a worldwide base map. It also offers HotFix and GLONASS technology to ensure a constant, accurate connection to orbiting satellites. You’ll get up to 16 hours of use with rechargeable batteries, but you can supplement that with 2 AA batteries for 22 hours of use. Like a few other Garmin models, the 680t includes an 8 MP autofocus-enabled camera, along with one year of BirdsEye satellite imagery. You can access over 4,000 waypoints, or save up to 10,000 points of interest. Save up to 200 custom tracks and create your own custom maps, as well. Want a small, light fully functional GPS unit for your kayaking adventures? Consider the Garmin eTrex 20x. Like other eTrex models, this one is designed to be very rugged in outdoor situations. It features a 2.2-inch, full-color TFT screen for good visibility in sunlight, and the screen is also usable with gloves on. The resolution on this unit is very good, with up to 65,000 colors. Inside, the unit offers 3.7 GB of storage plus the ability to add an SD card to hold even more maps. While it does not come with a BirdsEye subscription, it is compatible with BirdsEye maps, along with City Navigator NT, BlueChart g2 and HuntView maps. Like most other Garmin units, this one comes with HotFix and GLONASS technology for a reliable connection even in remote locations or under heavy cover. The eTrex 20x includes up to 200 routes, 10,000 points, and 200 saved tracks, with the ability to use automatic routing. 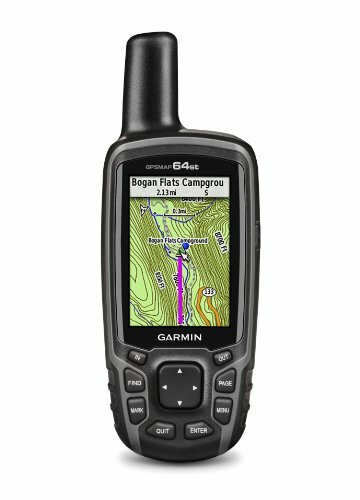 For those interested in a slightly different GPS unit, the Garmin GPSMAP 78 could be an excellent choice. It offers quite a few benefits, in a longer, narrower from factor than what’s found with many of the other Garmin units on our list. This kayak GPS offers good resolution combined with a 65,000-color TFT display that ensures usability and readability even in direct sunlight. However, the unit only offers 1.7 MB of internal storage. Saying that, the built-in microSD card slot allows you to additional storage. It provides HotFix and GLONASS satellite connectivity, as well as a WAAS-enabled GPS receiver. Like all the other GPS units on our list, this one features IPX7 waterproofing, but it is also designed to float if it falls into the water, ensuring you can easily retrieve it. It also allows you to make use of Garmin Connect, where you can share activities and track your device. The Garmin Oregon 700 is a handheld GPS unit with some interesting features. 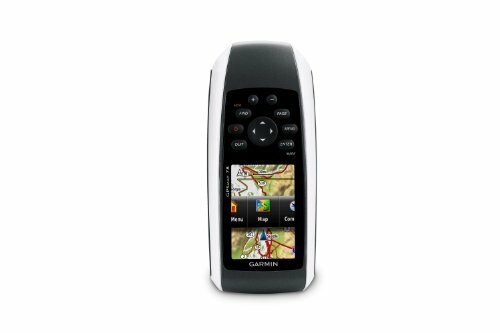 While it is not our top pick, it does rank highly when compared with other kayak GPS options on the market. The 3-inch screen is designed for use outdoors in direct sunlight. It also offers dual orientation – turn it for landscape or portrait mode. The unit also features a 3-axis tilt-compensated compass so you always know your direction of travel. Like a few other units on our list, it includes an altimeter function, but it also offers a built-in accelerometer so you always know your speed. The final choice on our list is an excellent option for those who want a simple, no-frills GPS unit for their kayaking adventures. 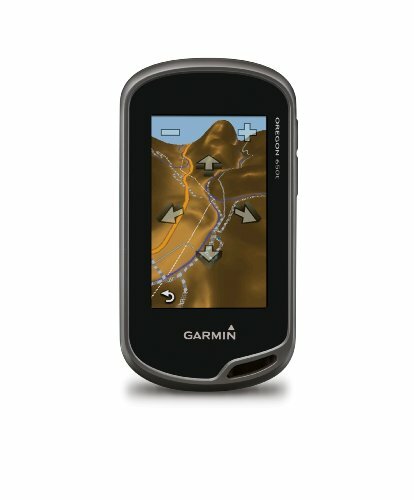 The Garmin eTrex 10 is compact and light – the handheld unit also features a simplified black and white screen. 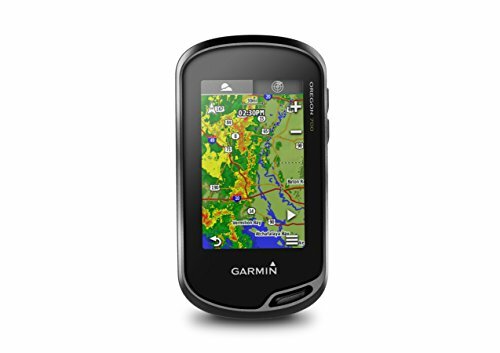 It comes preloaded with a worldwide base map, as well as Garmin’s own maps, and it is waterproof. You can set waypoints and track progress, and you can log up to 10,000 points and 200 tracks. 50 routes are stored, and this unit also offers automatic routing with optional mapping for detailed roads. However, note that you cannot add maps, nor does this unit come with a compass or altimeter function. This unit features a WAAS-enabled GPS receiver, with GLONASS and HotFix connectivity/support. Like others in the eTrex line, this unit is completely waterproof and offers rugged, durable construction. It also offers up to 25 hours of operation with 2 AA batteries. Now that we have covered the 10 best kayak GPS units on the market, we need to turn our sights to something else. Namely, we need to explore the features, functionalities, and considerations you need to make before choosing a model. While all of the GPS units on our list offer reliable operation and accurate location tracking, they are not identical. In the guide below, we’ll walk you through some of the most important elements to consider before buying one. Because we’re discussing kayak GPS technology, not general GPS use, we’re going to start not with mapping, but with waterproofing. It’s essential that the GPS unit you purchase is waterproof. Accept nothing less than IPX7 waterproofing – this is an international standard that means the device can be immersed in water without suffering harm. Ideally, your GPS will also float in water to help ensure it doesn’t sink to the bottom if it falls overboard. The entire point of owning a GPS is so that you can track your location, and to reach your destination, whether that’s a new fishing area or the boat dock. Make sure that the GPS you choose offers excellent mapping, with included access to accurate maps of the areas where you’ll be kayaking. All of the GPS units on our list are manufactured by respected industry leaders and come with accurate maps. This note is included in case you go off-list – not all GPS units on the market are reliable or accurate. Ideally, you will have access to more than a worldwide base map. You should also be able to download additional maps, particularly water-based maps. In a perfect scenario, you should also be able to create your own custom maps. The size of the display on your GPS is important for visibility and usability. The larger the display, the better you’ll be able to see the map, and the more room there is for details. However, the larger the screen is, the larger the device will need to be. If you go too large, the GPS will not be all that portable. We’ve included only one such device on our list – it’s our second pick, and while it offers excellent performance and lots of benefits, it’s not particularly portable. Look for a GPS with a decent screen size that offers good visibility, but does not compromise your ability to carry the unit easily. The GPS unit you buy needs to have a screen designed for outdoor use. Generally, this means looking for a TFT display. These offer full visibility even in direct sunlight. This is more important with a kayak GPS than any other use, as you’ll be out on the water and chances are good that there will be no cover. You’ll notice that all of the kayak GPS units included on our list offer GPS functionality, but several also mention GLONASS. The US GPS satellite network comprises 31 satellites orbiting the planet, but GLONASS connectivity allows you access to Russia’s network, which adds another 24 satellites to your available network. This can offer up to 20% better performance in terms of identifying your location. Finally, you should ensure that your GPS unit is WAAS-enabled. This stands for Wide Area Augmentation System, and it was developed by the United States in order to help eliminate errors in GPS location tracking. Without WAAS-enabling, your GPS will not be as precise. Your GPS needs to have a least some onboard memory. This is what stores the maps, tracks, custom points of interest, and other information. The more memory you have, the more data your device can store. Most of the kayak GPS units we’ve included offer a decent amount of onboard storage, and/or the ability to add more storage by inserting a microSD card. Note that if your GPS has a camera, you’ll need even more storage, and you should also consider investing in a high-capacity SD card to store your photos. You will need to access your GPS from time to time. 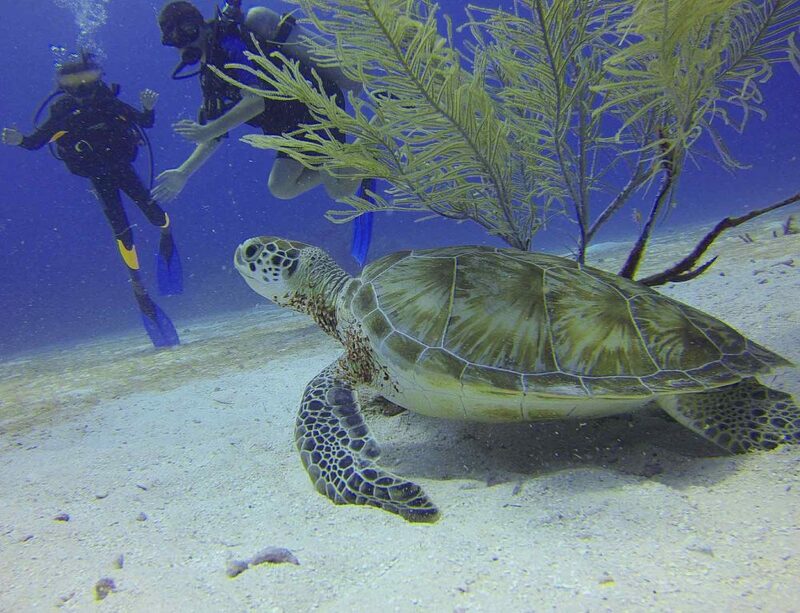 It might be to offload photos. It could be to share location or route information with another device. Really, there are many reasons why you’d need to do this. Make sure that the GPS you choose gives you that ability. There are three primary ways you can do this. USB: With this connection type, you’ll need to be able to connect your GPS to a PC or laptop. It’s used for updating maps, and offloading data from the device. Bluetooth: A growing number of GPS devices offer Bluetooth connectivity. This allows you to connect to some computers (those with Bluetooth) as well as to smartphones. Wi-Fi: A select few GPS units today offer Wi-Fi connectivity. You’ll find this feature mostly with GPS units that include a camera. It allows you to share data from your device directly to web-connected devices and websites. Size is an important consideration, and it’s something that every kayak owner will need to think about. How much space do you have in the kayak for mounting a GPS? How much room will the GPS unit take up in your pocket? The larger the device, the more it will weigh, and the more difficult it will be to transport. The smaller the device, the easier it will be, but the smaller screen may be less than ideal. You will notice that none of the GPS units we’ve covered in our list look like the ones you mount in your car. Why is that? Simply put, those other units are not designed for use out in the wild. They need to be protected from the elements. That’s not really possible with a kayak, so you need to ensure that the unit you choose is built to be rugged. In addition to waterproofing, which we’ve already touched on, the unit you purchase should be able to hold up to slight bumps and drops that will occur in outdoor use. The more rugged the construction, the longer your GPS unit will last. Should you opt for a handheld kayak GPS? A mounted unit? Something in between? Most of the units we featured on our list are handheld, and for good reason – it leaves you free to mount other devices in your kayak. Our recommendation is that you go with a handheld device unless your GPS also doubles as a fish finder. In that case, you would most likely want a mounted unit. If you do choose a mountable GPS unit, make sure you have a place for it in your kayak. Some models do not offer a center console, so you might need to get creative. Battery life is a very important consideration. All of the units on our list with the exception of the Humminbird model use batteries. The longer the battery life, the more use you’ll get out of your unit. As a note, many of the Garmin models we reviewed use a dual battery system that allows you to utilize a rechargeable lithium-ion battery pack, as well as 2 AA batteries. In most cases, you’ll get at least 16 hours of use out of your batteries. However, 20 and 25 hours of usage is not unheard of with some models. Knowing how long your charge will last is important for planning your expedition, too. 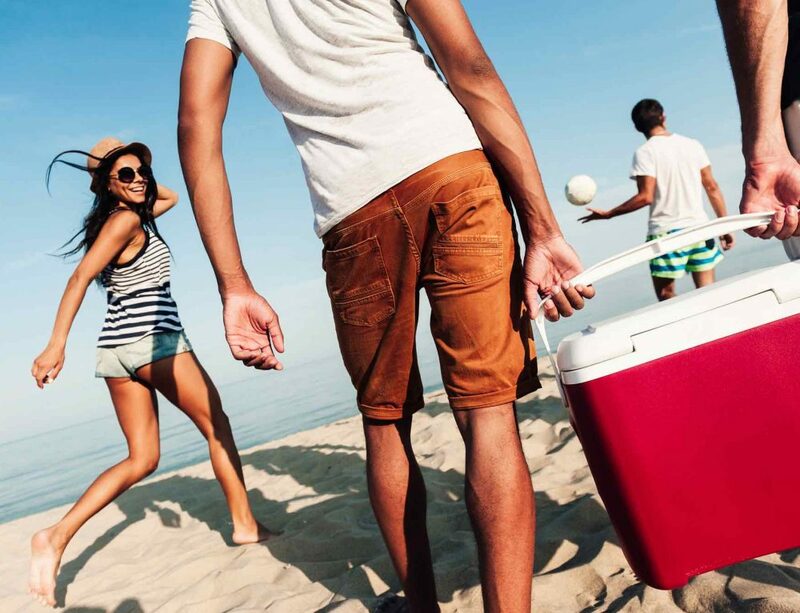 For instance, if you’re planning a multi-day trip, but only get 16 hours of use out of your batteries, you know that it would be smart to pack an extra set to make sure that you’re not left in the lurch. Finally, you need to consider the additional features available. One of the most obviously useful such features is fish finder functionality. We’ve included a couple of those on our list. They’re particularly handy for kayakers interested in fishing while they’re on the water, but who don’t want to purchase a separate fish finder. 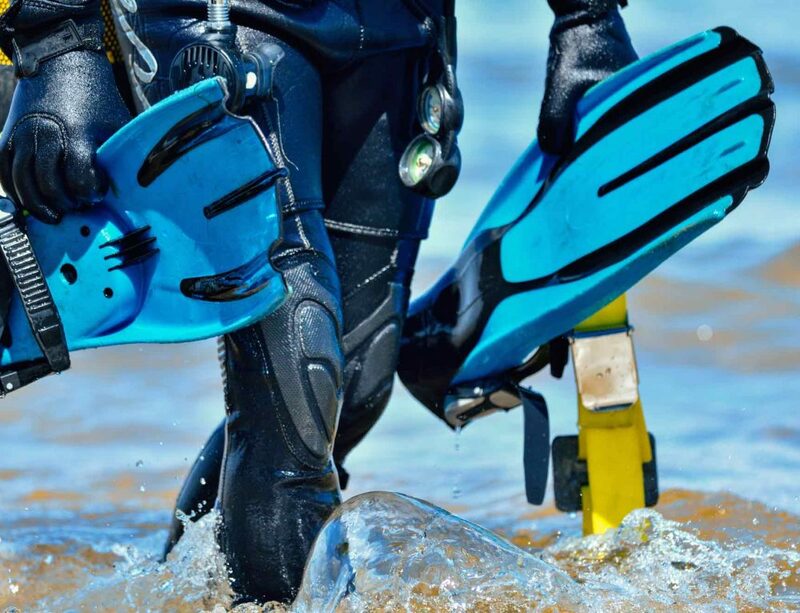 As a note, fish finders generally need to be mounted on your kayak for accuracy, so make sure you have somewhere to put it. Other additional features that you might find useful include geocaching, photo sharing, location sharing, route and map sharing, the creation of custom maps, and auto turn-by-turn navigation. Note that auto navigation is not available on the water – it’s only usable with road driving. 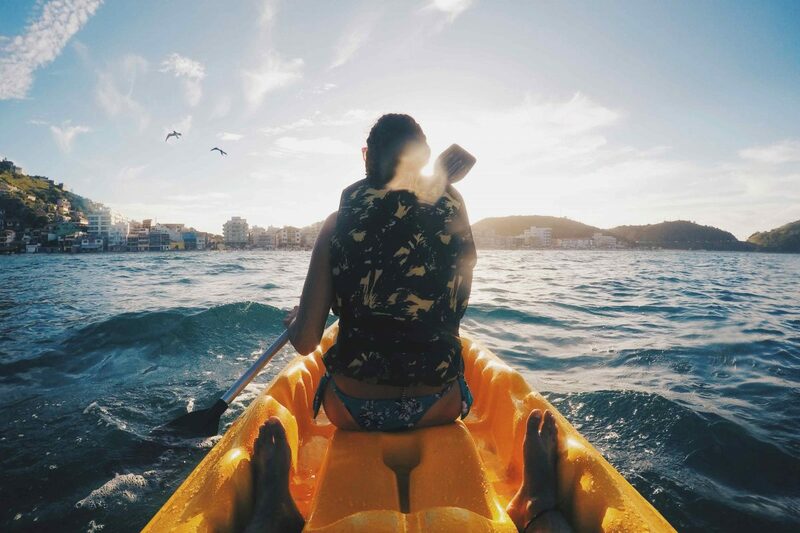 When it’s all said and done, the right kayak GPS will give you the peace of mind you need by providing you with accurate location information. However, you should look for more than just basic mapping. Choose a GPS that will help make your time on the water more enjoyable, whether you’re heading out to enjoy the beauty of nature, searching for that new fishing area, or you’re intent on reaching a remote geocaching location and exploring others. There is no one-size-fits-all answer that will be right for everyone. Consider your kayak – where will you mount a GPS? Will you need a handheld model? 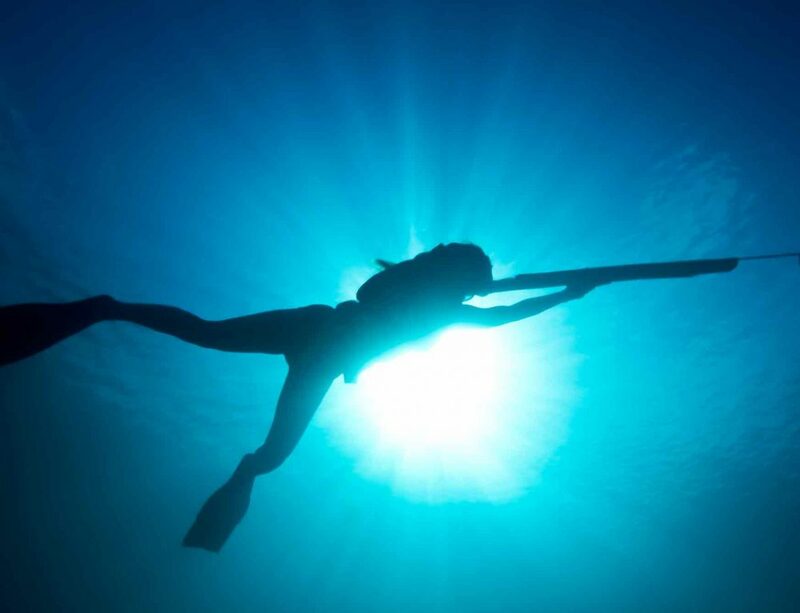 Consider your goals – are you looking for basic fun and enjoyment? Will you need a fishing aid? Do you want to get involved in geocaching or are you more interested in adventure? With the right GPS, you’ll have a powerful tool that ensures better safety and security on the water, while also giving you additional functionalities and features that make your time on the water more enjoyable.